I’m back from a whirlwind trip to NYC. It was supposed to be 3 nights and two full days, but I wasted one day being sick in the hotel room. 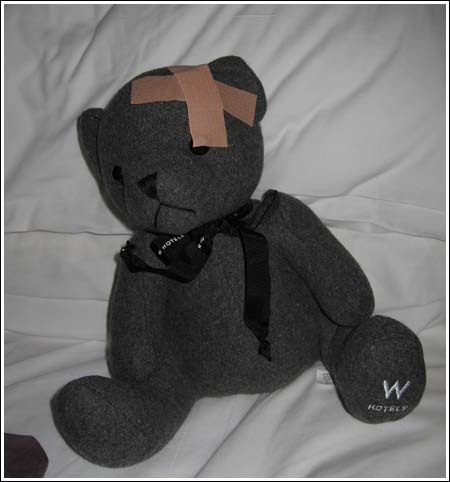 Luckily, it was quite nice and the concierge brought me a Teddy Bear and some medicine. I’m trying to do a trip report, but since it’s not really cookie related….in fact, not one cookie was consumed on this trip, I shall post it somewhere else and give the URL (for those interested) when I’m done – if I’m ever done. This was probably one of the best NYC trips ever, despite my day spent in sick bed alone in a hotel room. I met some fabulous buddies from the cooking contest world and met Todd English, who just happened to be at the restaurant in my hotel. He was very nice and sent out a bunch of dishes for us to try. My friends had spent the day at a stressful (yet fun) cooking contest, so this was a nice way to unwind. Argh. Sometimes it’s hard to incorporate all aspects of life into a cookie blog. So that’s all I have to say for now. I’m still trying to get back out of vacation mode and into real life mode which involves a lot of cleaning the house and catching up with my volunteer work. Stay tuned for another recipe which is on top of this big pile on my desk. It’s called “Baked Fudge” and it’s a version of the recipe I’ve never seen. Hopefully, I’ll be baking again tomorrow. Glad that you had a good time! We love Olives! You are so lucky Chef English was there! I’m still working on the trip report URL. Here are a lot of photos from the cook-off, which I wasn’t in. Also, some photos of us at the restaurant with Todd. How nice of the concierge to give you a teddy. Very sweet. Glad you are feeling better. I’m looking forward to hearing about your trip. What is CCC? Anna- Can’t wait to hear about your NYC trip. I was wondering what you were up too. Welcome back! I missed your daily blog!! Sorry you had a sick day but glad that you were able to eat and enjoy NYC! Welcome home, Anna. Sorry you lost a day being sick. Glad you had a wonderful meal with Michaela and Candy. Hi Anna. Sounds like you had a great trip – I saw some of the buzz and pics over at CCC. Sorry you were sick for part of the time, but sounds like the rest of it was fabulous.